The continuing saga, who will win? As the partial government shutdown continues, those of you who are relying on funding backed by the SBA have been put on hold. The Small Business Administration stopped processing new loans on Dec. 22. Thousands of companies can’t get their SBA loans approved, meaning they can’t get money they need to start or expand their companies. President Trump notes that there is no end in sight as talks with Democrats over the border wall have stalled. This is starting to push the panic button for banks and business owners who are finding out on the fly what bureaucracies are shutdown and what impact it is having on them. In addition to the SBA closure, farmers can’t get Agriculture Department loans or money from Trump’s fund to help farmers hurt by China’s tariffs. Businesses looking to go public with their IPO will have to wait, as the Securities and Exchange Commission is operating on a skeleton crew. The small business community that has heavily supported President Trump is now becoming less enthralled. One of many such examples is Brooks Troxler, who is a small-business owner in North Carolina. If Troxler doesn’t get the $550,000 SBA loan soon, he won’t be able to buy his dream commercial property. “The politicians don’t see how this is affecting small businesses like me,” says Troxler. SBA Administrator Linda McMahon met with Sen. Marco Rubio (R-Florida) last week and told him that her agency has plans in place to expedite loans as soon as the government opens again, according to a person familiar with the meeting who was not authorized to speak publicly. The trickle-down effect of the shutdown has reached the real estate market. Regarding the federal workforce, Mike Fratantoni, chief economist of the Mortgage Bankers Association remarks, “Buying a home is a statement of confidence. They are going to be much more likely to buy if their employment is stable and their [financial situation] is stable. The events of the last two months have shaken both of these.” While most loans backed by the Federal Housing Administration are continuing, about 5 percent are held up because they need special approval and no one is at the FHA to deal with them, according to the National Association of Realtors. A classic quote from entrepreneur Davis and Chef Kendra Baker, co-founders of the Penny Ice Creamery in Santa Cruz, CA, “It’s frustrating. We open our doors every day. I’m not in a position where I can shut down my business like the government,” Davis said. Very true. 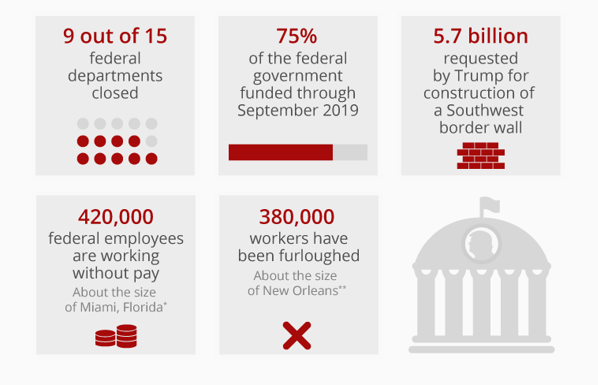 It is one thing to be furloughed by the government, but it is a far different scenario to possibly lose your business and life savings. Economists and the public, in general, have usually not been bothered by short government shutdowns, as they were short in tenure and received little publicity. The fact that the media is de facto anti-Trump assures that the public will be made known all-day every day that this is the President’s fault. Couple in the immigration/wall factor and you have a standstill that is all the more Trump’s responsibility. However, this time is different. There is concern that the length of this one is starting to hurt business confidence. Fitch Ratings also warned recently that an extended shutdown might damage the country’s Triple-A credit. Eyes will begin to open wide if this happens.